Happy New Year to everyone! 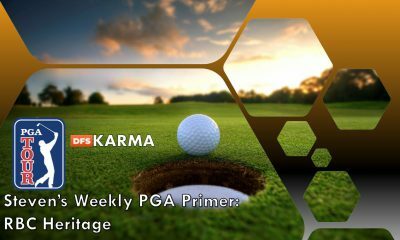 For those of you that did not play DFS during the swing season, this primer is new to DFS Karma and will be published weekly. 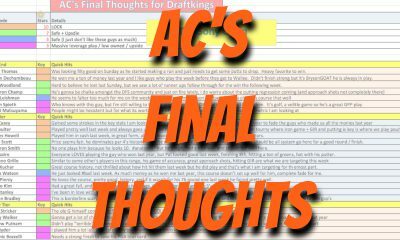 The goal with my weekly primer is to provide you with a one-stop guide to equip you with all of the information that you need to make your picks and assemble your lineups. From course previews, to history, stats, and pick suggestions, this guide will provide a concrete base as you conduct your own research and submit your winning picks and lineups. I openly welcome any feedback as this article evolves and is further optimized to benefit you. The PGA Tour season “restart” gets kick-started this week with the Sentry Tournament of Champions in Hawaii. 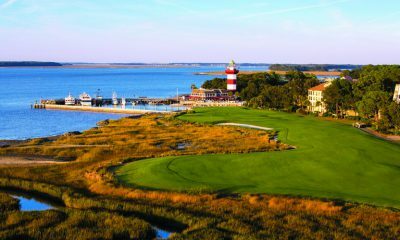 This tournament will be a much smaller field comprised of winners of last year’s PGA events. 34 of the 37 eligible golfers will tee it up at the Plantation Course at Kapalua in Maui. Last year, Dustin Johnson finished the weekend with a closing round 65 that propelled him to an 8-shot win over Jon Rahm. Brian Harman finished third after shooting a 72 in his final round. Rickie Fowler, Hideki Matsuyama, and Pat Perez finished tied for fourth. The highlight of the week came from Dustin Johnson on the Par 4 12th hole when his drive bounded down the fairway, rolled onto the green, and came about six inches short of being a hole-in-one. Surprisingly, familiar names such as Spieth, Fowler, and Matsuyama will not be in the field as they failed to win a tournament last year. Johnson will have to fend off former TOC winners Justin Thomas and Patrick Reed along with other names such as Jon Rahm, Brooks Koepka, Webb Simpson, Xander Schauffele, and Rory McIlroy. 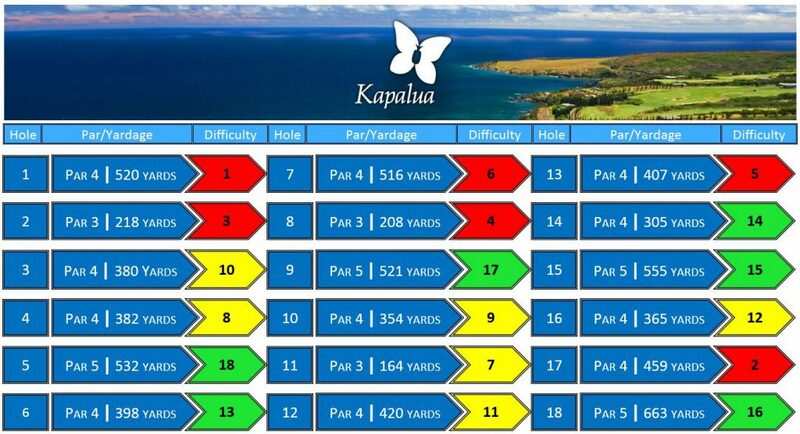 The Plantation Course at Kapalua plays as a 7,452 yard Par 73. Plantation sits in the West Maui Mountains at a higher elevation and downhill fairways that will yield some long drives this week. This is why I am not focusing in on driving distance this week as a key stat, but more on that later. The four Par 5s on the course play as the four easiest holes on the course with the 5th hole yielding birdies over 63% of the time and the other three leading to birdie no worse than 45% of the time. This course has seen golfers go low in the past. Last year Dustin Johnson finished at -24. Prior to DJ’s triumph, JT, Spieth, and Reed went -22, -30, and -21 respectively. We should expect to see similar scores this week as well. This chart gives you all that you need to know about the strength of this field this week. Not surprising considering the nature of the tournament and the composition of the field. 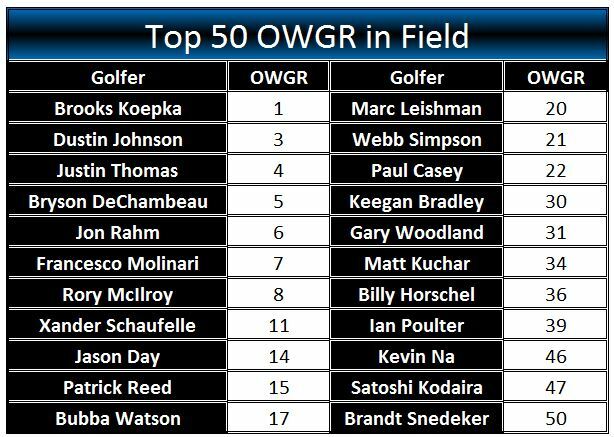 Solely comprised of winners from last season yields a field of 22 of the Top 50 ranked golfers in the world. 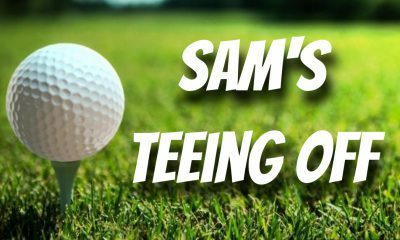 This is a very strong field and we should have an exciting week of golf with the no-cut event and all golfers getting a full four rounds of golf. Don’t be quick to dismiss the weather forecast for this week. While the trade winds typically remain calm and do not impose their will, Justin Thomas did tweet early on Tuesday during his practice round that the wind kept his 9 iron from 116 yards short of the green. This could play a factor considering JT usually averages around 160-165 with his 9 iron. 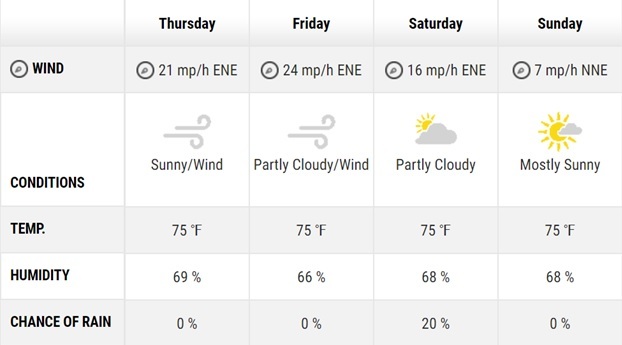 Monitoring the wind and weather could come into play this week more than it has in the past at this tournament as gusts could reach up to 21 and 24 mph Thursday and Friday before calming on the weekend. This will be an important factor to consider. These stats do not come as a surprise with the ability for the golfers to drive the ball long and setting themselves up for wedge shots into the green. A strong approach game and scoring on the Par 5s will be key this week. I also sprinkled in Par 4 Scoring from 350-400 yards. The last three winners all finished first in Par 4 scoring during their championship week. Seven of the eleven Par 4s fall into the 350-400 yard range. With scores often exceeding -20, bogey avoidance and scoring are also key. Course history can be extremely insightful when evaluating how a course fits a particular player and if a player has “an eye” for the course itself. There are three past champions playing this week including Dustin Johnson, Justin Thomas, and Patrick Reed. Here is a breakdown of some notable players that have performed well and finished inside the Top-30 at Kapalua in the past. Before I even begin making picks I have a break down of the field into six tiers, A-F. When you have fields of 100+ golfers then it can be overwhelming to scroll back-and-forth and up-and-down when making picks. DraftKings has a useful tool where you can export the entire DK roster with salaries to a CSV and open in Excel which I would highly recommend and then break down the picks from there. When I am assembling my lineups or placing my bets, I will look at just about every stat that I can while also looking at course history and recent performance. There are certain players that just perform well at certain courses. Webb Simpson at the Wyndham, Zach Johnson at the John Deere, Jordan Spieth at the Master’s, Bubba Watson at any course that he has won, etc. You also have to look at how players are performing leading up to the tournament. I was burned multiple times last season by ignoring, or simply overlooking, this aspect when it came to picking or not picking Jordan Spieth. If you have an instinct or gut-play feeling for a golfer then use the statistical information available to you to help supplement your picks. 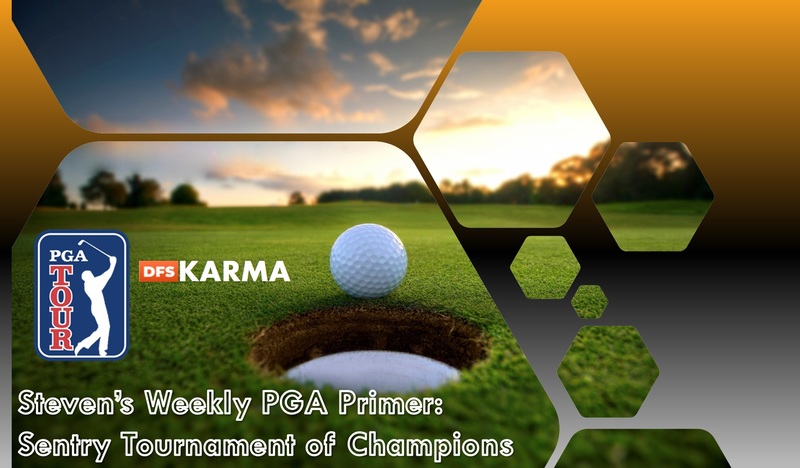 Each week I will preview golfers from each salary range: >$10k, $9k, $8k, and $7k and below. I will also have a few other suggestions for golfers that I also like and that can be considerations for pivots or salary relief. 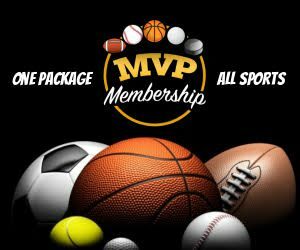 The odds for each golfer is provided by mybookie.com. I know that I am not going out on a limb here suggesting the highest salary golfer but with the overall talent in the sub-$7,000 range you may be able to afford DJ and still have room to build a solid roster. The argument for DJ is that he has four Top 10 finishes here including a win last year where he blew the filed away by 8 strokes. The only two lackluster stats that he has is in Par 5 scoring and Par 4: 350-400 yards. 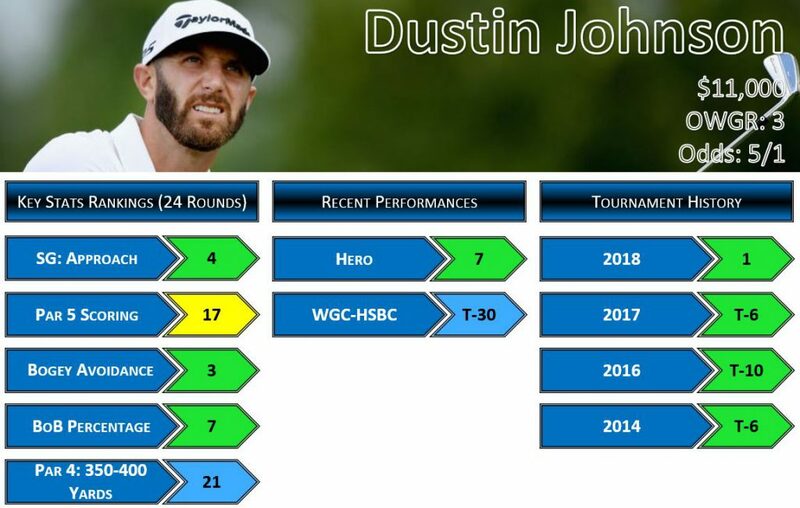 I would not let this sway you from rostering him if due to the fact that he almost aced the Par 4 12th last year from 335 yards and DJ’s length will have him gaining significant strokes on the Par 5s. DJ does also rank 13th in overall SG: Par 4. DJ also ranks 2nd in SG: Par 4 and 8th in Par 4: 35-400 over the last 50 rounds. He has also played 31 rounds of golf at Kapalua without having ever shot over par. No hesitation in rostering DJ this week. Also Consider: Brooks Koepka—$10,200 (OWGR: 1, 8/1) Koepka could be a nice pivot from the two higher salaried and former champions JT and DJ. You also get the #1 golfer in the world for $800 cheaper than DJ. My pick to win this event is Jon Rahm. I could even understand starting your roster with Rahm and going for a more balanced approach. 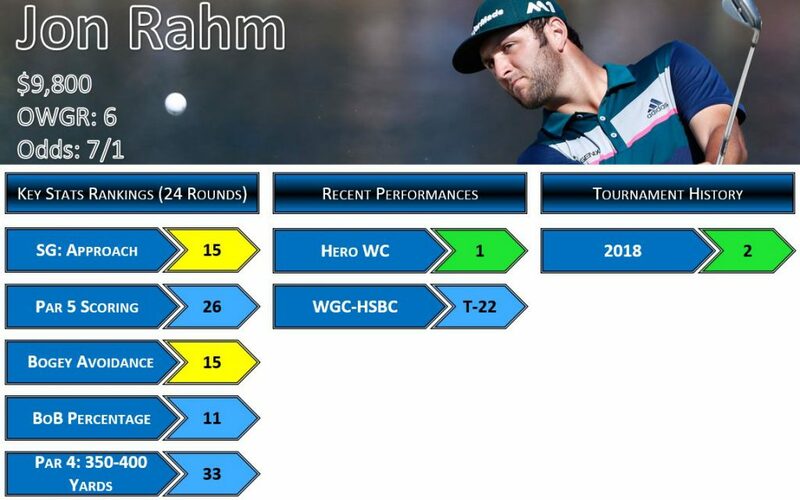 Bear with me, I know the key stats are not popping right now for Rahm but he does rank 9th in SG: OTT and 8th in Birdies Gained. Rahm also ranks 10th in BoB Percentage and 7th in Par 4: 350-400 over the last 50 rounds. With the winds expected to have an impact, I like Rahm’s ability to grind and play in windy conditions. He loves playing in these high quality tournaments as evidenced by his solo second place finish here last year. The Spaniard comes into the event after a win at the Hero World Challenge a few weeks ago by four strokes over some of the biggest names and in a high quality field. Winners of the Hero World Challenge have also played well in this event in the past. Fire Rahm up in your lineups. Also Consider: Webb Simspon—$8,500 (OWGR: 21, 22/1) I have already read quite a bit about this being a bomber’s course. Length will help, of course, but we are going to see multiple 400+ yard drives this week with the altitude and elevated tee boxes. This means that driving distance will be somewhat neutralized where golfers like Webb can still hit wedges into the green and putt for birdie. The “Mad Scientist” comes in at a surprisingly low salary considering his last six months of competition. 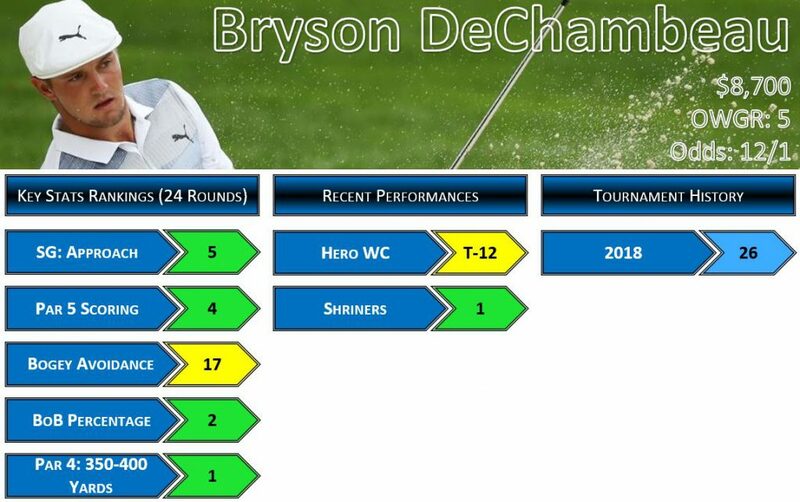 Bryson loves playing in high quality fields as evidenced by his two wins in the FedEx Cup Playoffs last season and he has already won in the swing season as the Shriners. His stats speak for themselves. I read an article on Bryson prior to his win last year at the Memorial that if a course emphasizes Par 5s then Bryson needs to be rostered based on his ability to score. Sure, I’m from Dallas where Bryson played at SMU but I’m not his biggest fan. I think Bryson tries way too hard to be the “smart” guy on tour and now the commentators are playing to that narrative on just about every shot that he takes, however, I can’t deny that he can play with the best-of-the-best and that this course fits him well. I see Bryson as a value play at $8,700. Also Consider: Xander Schauffele—$8,300 (OWGR: 11, 22/1) I think Xander may be a good pivot in this range if Bryson goes highly owned and if the past champ, Patrick Reed and popular plays like Molinari and new DFS Darling, Cam Champ are more popular plays in this range. 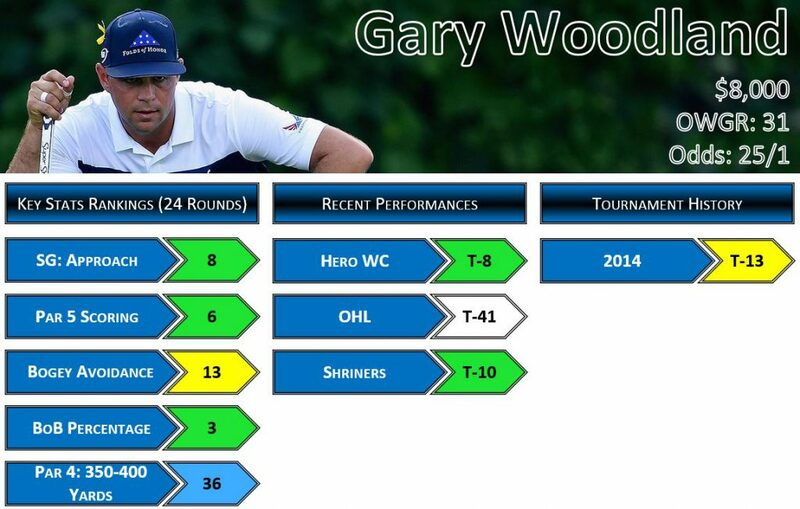 Another one of my favorite plays this week, and someone that I am placing some money on an each-way, is Gary Woodland. He can bomb it and he can get the ball close to the pin on approach as he ranks 10th in Proximity and 9th in Putting from 10-15 feet on Bermuda. Woodland does sometimes tend to fade over the weekend but I expect Woodland to get off to a quick start this year after finally picking up a win last year at the WMO Phoenix and performing strongly as-of-late. He should find himself on the green in two quite often on the four Par 5s resulting in birdies and possibly a few eagles as well. His solid recent performance and ability to score on Par 5s will propel him up the leaderboard come Sunday afternoon. When I saw the wind in the weather forecast earlier this week, the first player that came to mind was Marc Leishman. Leishman is known for his ability to play in windy conditions that will benefit him this week. If the wind does indeed play a factor this week then some of Leishman’s sub-optimal statistics so far should be counteracted by his ability to grind through the windy conditions. Leishman did finish tied 7th here last year after he found himself as the first-round leader and the co-leader going into the weekend. 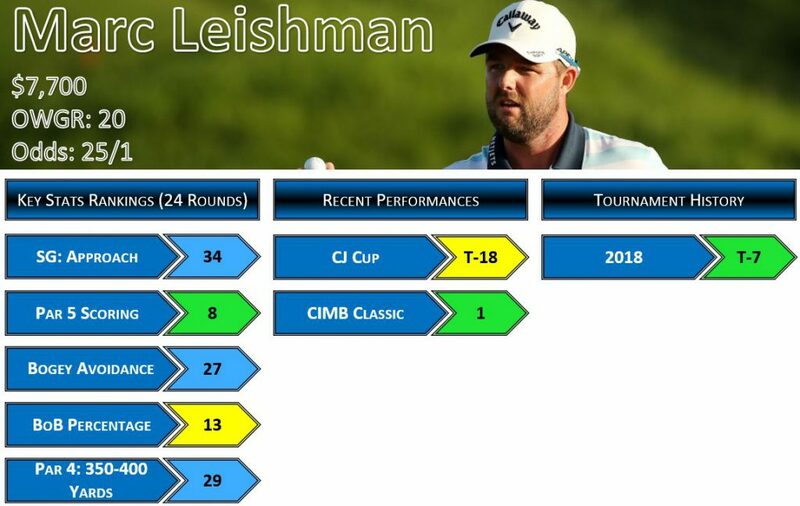 Interesting of note, three of Leishman’s wins at the BMW Championship, CIMB, and Nedbank have also come in high-quality fields and also happened to be no-cut events. It looks like Leishman could be setup for a strong performance. If you are planning on rostering DJ or JT this week then you are probably going to have to find some value at the bottom of the salary ranges. If you are in need of a lower salary then why not go with a guy that can bomb the ball and has recently won? This brings us to Kevin Tway. Tway recently won the Safeway Open and could set himself up for many scoring opportunities this week as evidenced by his 15th ranking in Birdie Opps Gained and 7th in SG: Putting. Tway also ranks 13th in Par 4: 350-400 yards over the last 50 rounds. 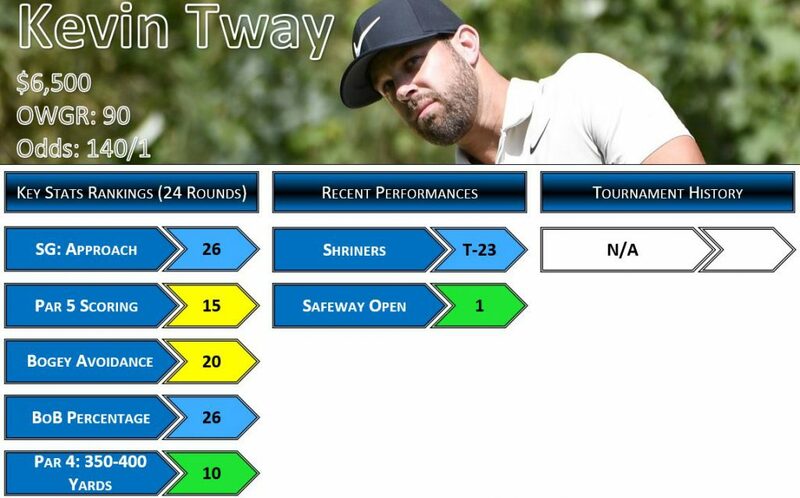 We saw Tway compete in bigger tournaments last year and finally broke through at the Safeway. I expect Tway to continue that momentum into the TOC. That’s it until next week as the Tour remains in Hawaii but shifts to the Sony Open in Honolulu. Good luck this week and, as always, let me know what other tools or information would be helpful for your weekly picks!